The location was on East West Highway in Silver Spring, Maryland. The "Take It!" came from one of those rare chances to almost duplicate a shot that I had missed on the first pass. 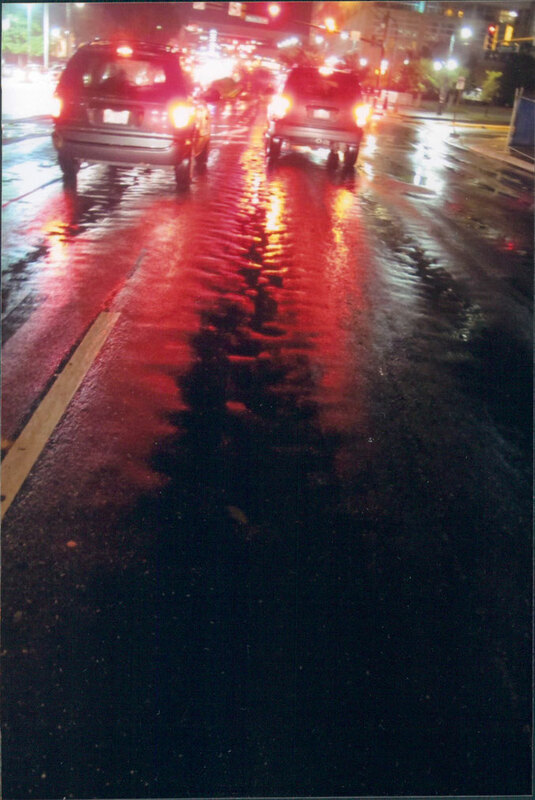 I had observed this phenomenon in the reflection of a wet street. Tail lights of a car stopped in front of me as I went through this intersection about 5 minutes before. At that time it did not fully register in my mind as being a photo opportunity as I was more consumed with giving myself a safe margin of distance from a stopped car in front of me. As I drove away, I had the realization of the beauty in the randomness of this image. I finished the business of why I was in that neighborhood and went back to the original location with the hope of being able to catch it again. As luck and placement would have it, I was fortunate enough to have a near duplicate of the original viewing play out once again for our enjoyment. I jumped out of my car and took the shot in the rain with the hope that it would somehow turn out ok. I must say it turned out to be a struggle for my camera to deliver as there was so much other lighting interference, but my trusty camera gave us the best that it could, and for this I gave it kudos (Yes I sometimes talk to inanimate objects,and do not think I am alone in this practice). The After Take: This is one more in what is becoming an unintended series of reminders to sieze the moment when ever possible. If the moment is not caught, and it was vivid enough, see if you can catch it again. Even if you do not have the good fortune to catch it one more time, the act of attempting will help to imbed the image into your mind as a part of that collage of wonderful images we keep in our subconscious. Sometimes the mundane can be splendor, it is all in how we let ourselves see things. Thanks for joining us for the current photo presentation. You are cordially invited to return Friday, August 10th for a new picture that we hope you will enjoy. PS: It has taken me many months to be able to have this shot be settled enough in my mind to be able to sort out the many thoughts it has brought to me and put some of them into words. The colors on this one are intense! Did you take this from your car or did you quickly run into the middle of the street? Some of your photo's bring out various emotions in me. This is one of them..... Brings out that kind of, "Man I dont want to go to work" feeling. Probably because I am not a big fan of the rain. Great photo opp nonetheless. As always, great photo! Also, I really like being able to navigate to the most recent photos quickly. Posting them on the homepage was a good upgrade for this website. Oh wow, I just noticed that Jeff. Ya thats pretty cool.